The violence and repression carried out this past weekend by the authorities in Toronto, where the G20 summit was taking place, was worthy of a police state. An army of security officers, both in uniform and undercover, took over the downtown portion of Toronto, a major world city, creating conditions of “martial law,” in the words of a columnist for the right-wing Toronto Sun. The police operation was used to violently repress an overwhelmingly peaceful protest by thousands of people opposed to the policies of the governments represented at the summit. Even prior to the demonstration, police preemptively arrested alleged leaders of the protest. The massive state operation was a brazen assault on basic free speech and assembly rights. The CCLA report understates the level of repression. 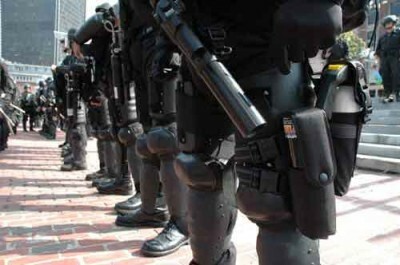 According to diverse accounts, the police—outfitted in riot gear and wearing gas masks—acted in an extremely provocative and brutal manner, beating marchers and bystanders alike, firing rubber bullets, charging into peaceful crowds, trapping protesters and making them wait for hours in the pouring rain, depriving detainees of food and medication, and generally trampling on the most elementary rights with sadistic glee. The cops were given a green light to do as they pleased against the population. This was the culmination of a lengthy process. According to the CBC, “CSIS [Canadian Security Intelligence Service] has spent the last 12 to 18 months gathering intelligence it hopes could help the RCMP [Royal Canadian Mounted Police] with ‘any breaches of the law that might occur’” at the G20 gathering. In a deeply antidemocratic move, the provincial cabinet passed a new regulation June 2 under the Ontario Public Works Protection Act of 1939 allowing the police to require individuals approaching the “security zone” around the G20 meeting to show identification and to subject them to searches, under penalty of arrest. The attacks on democratic rights prior to the G20 and the massive police action last weekend had little to do with locating and disabling “100-150 vandals,” among whom there were no doubt a considerable number of police provocateurs—any more than the US war in Afghanistan is about capturing or eliminating 50-100 Al Qaeda members. The security operation in Toronto (and Huntsville, Ontario for the preceding G8 Summit), which cost the Canadian government in the area of $1.2 billion, was aimed at further criminalizing political protest, intimidating opposition and creating the conditions for even greater repression. It had the character of a dress rehearsal for even bigger operations. The state violence outside the G20 meeting was closely linked to the policy discussions going on inside the Metro Toronto Convention Centre, which centered on plans to make working people around the world pay for the capitalist economic crisis. Every head of state present, most of them despised by their own citizens, knows that the measures to be taken against the living standards of hundreds of millions of people worldwide will provoke anger and opposition, as the Greek events have demonstrated. The austerity policies cannot be implemented peacefully and democratically. They must ultimately be imposed by force. The transformation of downtown Toronto into an armed camp, for the purpose of protecting the cabal of bourgeois politicians, joined by the managing director and chairman of the International Monetary Fund and the president of the World Bank, is expressive of the real state of social relations on a global scale. Ranged on one side—the bankers, the corporate elite and their political flunkeys; on the other—broad layers of the population, as yet politically unclarified but determined to fight for decent conditions for themselves and their families. The ruling elite has the advantage at this point of a higher degree of consciousness about its crisis and the steps it needs to take. The right-wing minority Conservative government of Stephen Harper in Canada, along with the Ontario provincial Liberal government of Dalton McGuinty and the local Toronto authorities, took pains to organize a major confrontation with protesters, which they hoped they could use to their political advantage. The holding of the event in the middle of Toronto was itself something of a provocation. The city has been a center of anti-globalization sentiment and a mass showing of opposition could be counted on. A columnist from the Vancouver Sun, perhaps hinting at more than she meant to, referred wonderingly to “a Conservative decision last fall to hold the G20 in a congested place like downtown Toronto,” and mused, “It is hard to understand why Ottawa knowingly would have agreed to provide a venue for the mischief-makers.” A good question, which hardly permits an innocent answer. The claims by police, who had infiltrated and carried out surveillance against organizers of the G20 protest for a year-and-a-half, that they were taken aback by the violence are too crude and transparent to be taken seriously. One should have no doubt that the police knew the anarchists’ plans better than the anarchists, even helping to draw them up. The burning of police cars, which had been conveniently left in the path of the “Black Bloc” forces (one of them reportedly with its gas cap removed), was another dubious event, primarily intended for the national news programs. The Harper government hopes that the sight of anarchists “rampaging” through the streets of Toronto will inflame the more naïve and backward sections of the Canadian population and beef up support for its law-and-order, anti-working class policies. The events in Toronto are a serious warning. The level of official violence is being ratcheted up. In the face of the upheavals to come, the state in every country is working up plans for mass repression. What dominates the politics and social relations of every country is the global economic crisis, which has reached an advanced stage. All the emphasis must now be placed on the development of a consciously socialist and internationalist movement of the working class, the only progressive response to the police state provocations and violence of the ruling elites.